Click here to view our Chinese Antiques Furniture Collection on our new website! streamlined condo we have something for everyone. We have small pieces to organize as well as decorate your home. Pieces like rice measurer that can serve as filers for example. 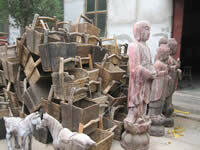 Chinese baskets, buckets, paper mache bowls, stools, small benches, and even small ornate jewelry boxes. Our stock also include beautiful Chinese doors that will make the exterior of your home stand out. The range of colors & textures in these Chinese antiques are a refreshing change to traditional furniture. Most of our pieces are reworked for a modern end user. Altering panels to create doors, including shelves and replacing broken hardware are a few of things done to these peices. Some of the most interesting aspects of Chinese antiques are the use of woods, patterns and designs that North American antique buyers have only had limited exposure to in the past. 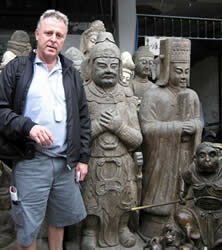 Vancouver Chinese antiques are affordable, expressive and more individual than the vast portion of traditional antiques. They are bold but not overpowering. Antique but still fresh and bright. 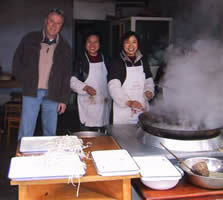 Classic examples of China's long and rich aesthetic history. In our gallery you will find Chinese wardrobes, cabinets, sideboards, end tables, console tables, tv stands, desks, coffee tables, hall tables, noodle cabinets, bedside cabinets, filing cabinets, carving tables, abacus, ship's wheels, bowls. Chinese Antiques Gallery 32 - NEW ARRIVAL!